Taxi is the only means of transport to town. The airport is located 12 km from Assisi. International airport “Leonardo da Vinci” Fiumicino Roma. – Highway exit: Valdichiana,, take the direction to Perugia and then to Cesena (E45), leave the highway at the exit Assisi. 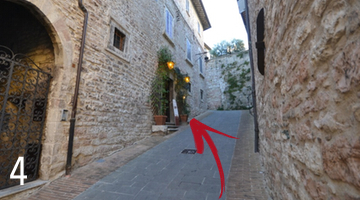 – Highway exit: Orte, take the E45 direction to Perugia-Cesena, leave the highway at the exit Assisi. 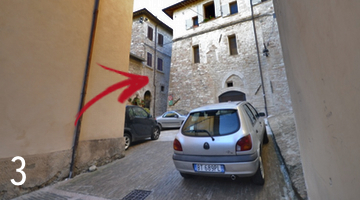 To get to Medioevo Restaurant you can park at Mojano parking lot. The new escalators will take you very close to the restaurant. 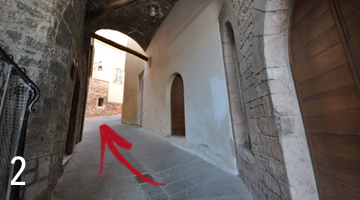 At the end of escalators, turn left and go under the arch of the first street on the right (see the picture) and follow the signs to “Chiesa Nuova di San Francesco” which stands on the same street of the restaurant. 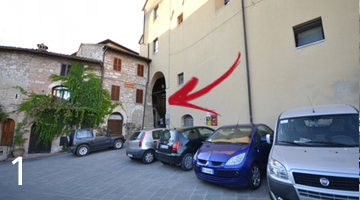 If you park at Piazza Matteotti parking lot, as soon as you get out of the underground elevators you will find yourself in Via S.Gabriele dell’Addolorata, take the right and go to Piazza del Comune. 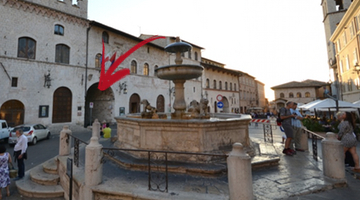 When you reach Piazza del Comune, you will see an arch behind the fountain, pass under the arch and take Via Arco dei Priori, walk along the street for a few meters and you will find the restaurant on your right.